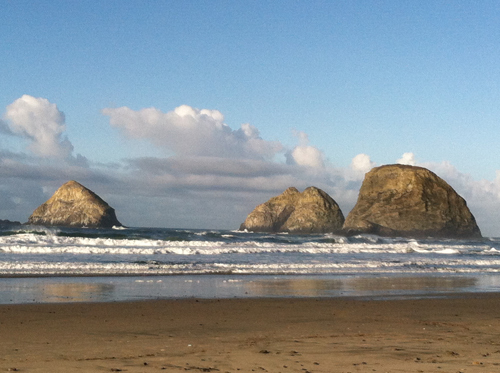 The storms have passed and the weather continues to be beautiful on the northern Oregon coast. Alas, the states to the north and south of us are not so fortunate. I am keeping family and friends in my thoughts. 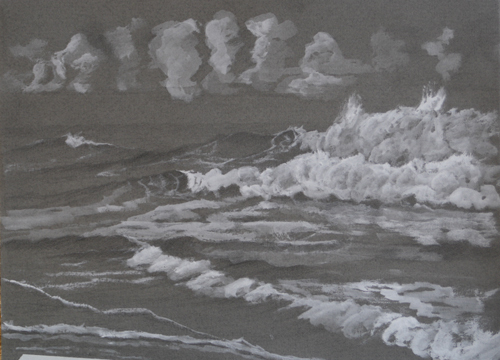 Yesterday morning I went out to our beach and did another graphite and gouache wave study sketch. The waves were still quite rough from the storm and they piled on top of each other. The water churned with waves crossing and re-crossing. 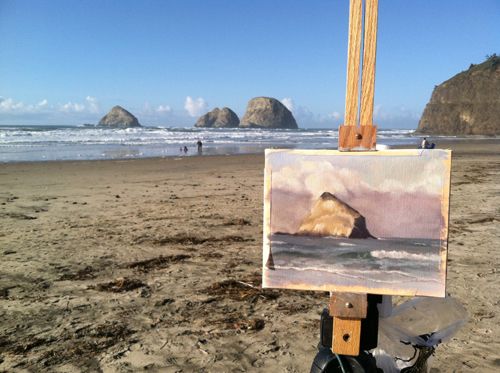 The sun was out and very little wind so it was a good day to be out sketching. 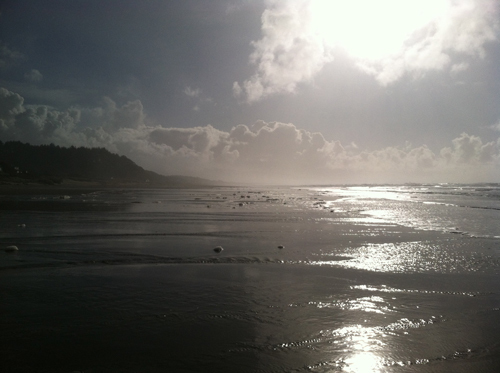 Here is a view looking south down the beach from the foot of Neahkahnie mountain. © 2014, R.L. Delight, Wave Sketch, 8"x10", graphite and gouache on paper. As you can tell, I wasn't paying too much attention to composition as I was still trying to get a handle on using the gouache. I am getting used to it but still struggling with it a bit. Overall, I have to say I really like this method of sketching. Today my mate had a job that was about a 40 minute drive down the coast in Oceanside, Oregon. I decided to grab my paint pack and go with him. I don't head south to paint very often. The beauty of this coast was out in abundance today making me think that I will have to consider getting south more often. 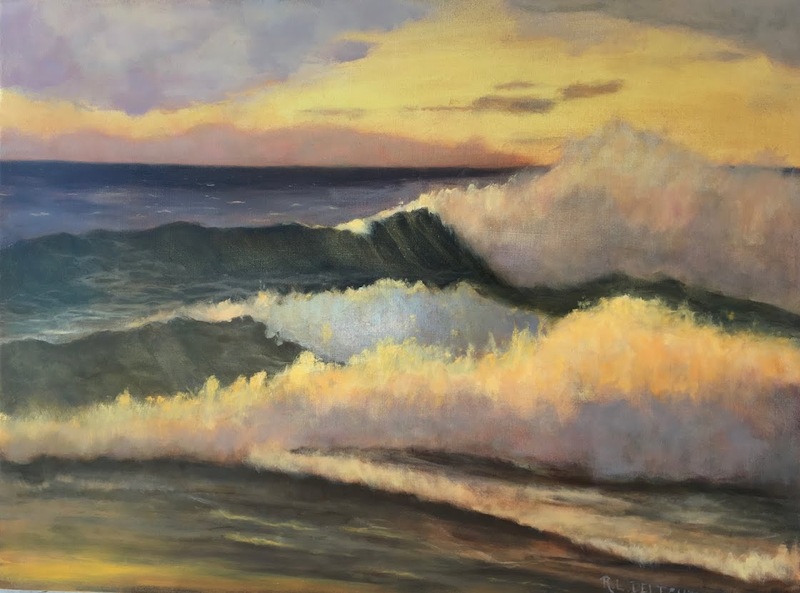 There is so much to paint within a five minute walk or drive of my house that I seldom feel the need or desire to leave the area. Yes, I do consider myself most fortunate and blessed to live here! I will admit that I am out of practice. It doesn't take much to get that way! It feels good to be able to go out again. I took my time deciding what to paint but I did not make a sketch before hand. I didn't know if I would only have one hour or two so I worked as fast as I could. Turns out it was closer to two hours. © R.L. 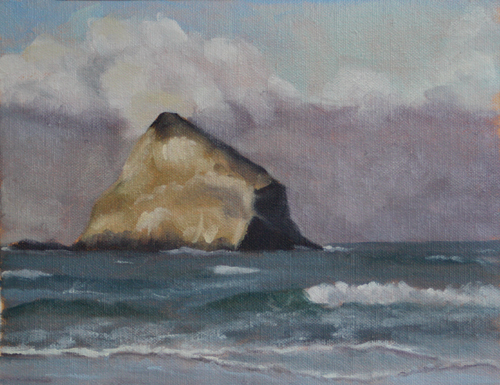 Delight, 2014, Oceanside study, 8"x10", oil on canvas. This is most definitely a study. I am trying out many of the tips and techniques I was reading about while recovering from a bout with minor illness. The rock color was a bit challenging as it was different from the rock color up the coast. I am not really surprised by that. Overall, a very satisfying couple of days. It will be a bit challenging getting out this week as the holidays are ramping up. I am looking forward to a visit from dear friends and music making and celebrating with our bandmates.